.. steps to analyze NYC Chelsea area demographics that can be applied to any neighborhood … demographic characteristics of the Chelsea area in New York City, an area west of Avenue of the Americas between 14th and 34th Streets, is radically different from adjacent areas. This topic was covered in a “great wealth divide” New York Times story. This section reviews how census block and block group demographic-economic data can be used to examine these patterns. 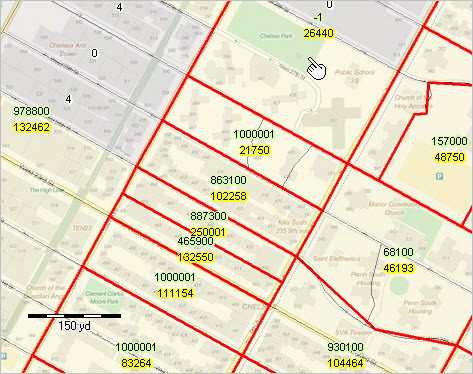 A GIS project is used that associates census block and block group data for visual analysis Methods summarized here can be applied to any area. Use the tools described in this section to obtain demographic-economic profiles for any neighborhood based on an address. See related Web page for more detail. 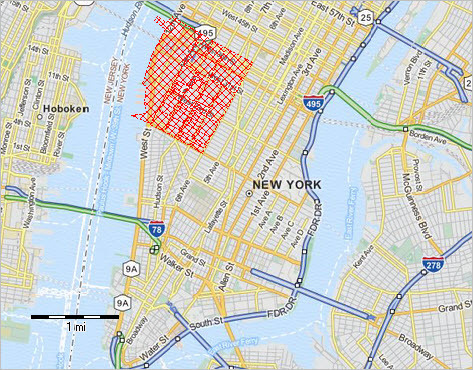 See related post on Most Populated New York City Census Blocks. 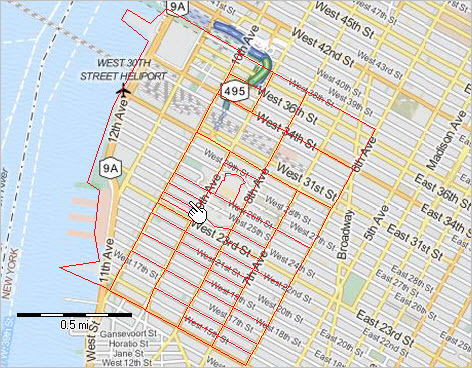 The study area, a group of selected census tracts, is shown as the red cross-hatched area in context of lower Manhattan in the view below. The next view shows a zoom-in to the study area. Block groups are shown with a red boundary. Chelsea Park is visible as the green area above the pointer south of 29th street. The next view shows a further zoom-in showing census blocks with black boundary and block groups with red boundary. Census blocka are shown with a semi-transparent yellow fill pattern (population greater than 4) and gray fill pattern (blocks with population less than 5). 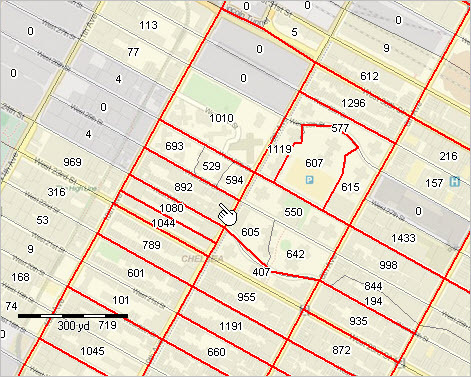 The block group containing Chelsea Park (green area above pointer) contains three census blocks, 2 with no population and one with 1,010 population. 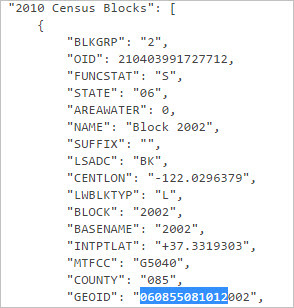 Block data are from Census 2010; there are no post-Census 2010 block level demographics available. The analysis could be extended to shown wide-ranging demographics at the block level. In this further zoom-in, Chelsea Park (green area) is shown near the pointer. Census block population labels are turned off for blocks with 5 or more population to help show a less cluttered view. Block groups are labeled with two values. The yellow upper label shows the median housing value (MHV). The green lower label shows median household income (MHI). Both data items are based on the American Community Survey 5-year estimates (ACS 2013) are centric to 2011. The ACS data are updated annually; as of October 2015, the latest data are from ACS 2013; the ACS 2014 data become available December 2015. The ACS 2013 5 year estimates are top-coded at $1,000,001 for MHV and $250,001 for $MHI. The block group containing Chelsea Park has a median household income of $26,440; the median housing value estimate is not available (too few owner-occupied units to develop MHV estimate). The Chelsea Park block group code is “360610097002” — this code uniquely identifies this block group among all other block groups in the U.S. The block group immediately to the south of the Chelsea Park block group median household income of $21,750; the median housing value estimate is $1,000,001 (top-coded). The code for this block group code is “360610093006”. While the MHI for BG 360610093006 might seem like it should be higher, a look at the number of households by income interval explains this number. Almost half of the households in the BG have a household income below $20,000. Analytical options that might be considered include using mean household income or mean family income instead of median. Compare number of households by household income intervals for these two block groups. 2. Click here, key in an address then click Find to locate the 11 character BG code. — copy the first 11 digits of the GEOID value to clipboard see illustrative graphic. 3. Paste those 11 characters into the URL, replacing the “XXXXXXXXXXXX”; this modification must be exact. 4. Press Enter. A profile appears comparing your BG to the Chelsea Park BG 360610097002. 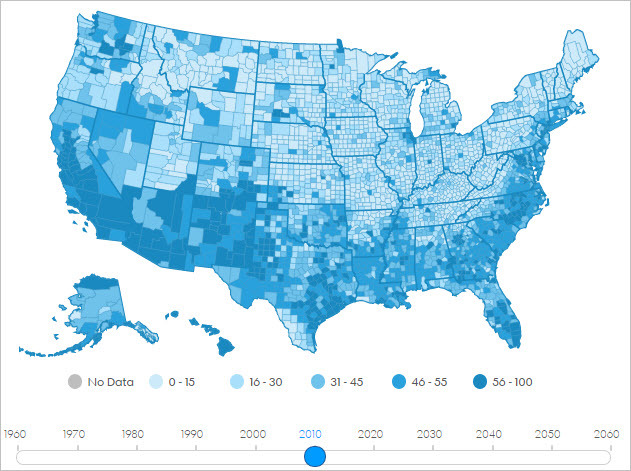 .. USA TODAY uses ProximityOne county demographic projections to 2060 to analyze patterns of diversity. See main story. See related Web section. 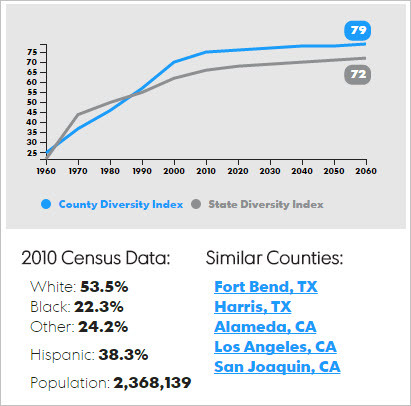 The diversity index measures the degree of racial and ethnic diversity of the population. 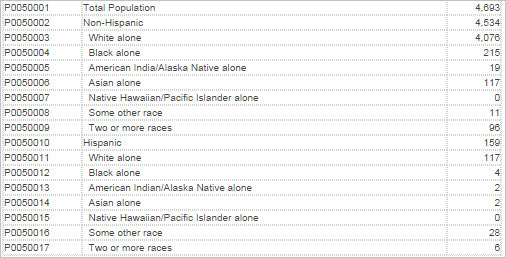 The percentage of each race (White, Black, American Indian/Alaska Native, Asian, Native Hawaiian) and Hispanic origin/ethnicity are used to calculate the chance that any two people are from different groups. The index ranges from 0 (no diversity) to 100 (highest diversity). From USA TODAY main story … “USA TODAY used Census data to calculate the chance that two random people are different by race or ethnicity and came up with a Diversity Index to place every county on a scale of 0 to 100. The nationwide USA TODAY Diversity Index hit 55 in 2010, up sharply from 20 in 1960 and 40 as recently as 1990. In South Orange, the index is 59. This is just the beginning. Barring catastrophe or a door-slam on immigration, the Diversity Index is on track to top 70 by 2060, according to a USA TODAY analysis of population projections by ProximityOne of Alexandria, Va. That means there will be less than a 1-in-3 chance that the next person you meet will share your race or ethnicity, whatever it is: white, black, American Indian, Asian, Native Hawaiian or Hispanic. Visit the main story. Scroll down to the interactive section shown below, illustrating the chart and data for Maricopa County, AZ and Arizona. Key in a county name of interest to view the chart and data for that location. Join the ProximityOne User Group to keep up-to-date with new developments relating to children’s demographics and school district decision-making information resources. Receive updates and access to tools and resources available only to members. Use this form to join the User Group. There is no fee. 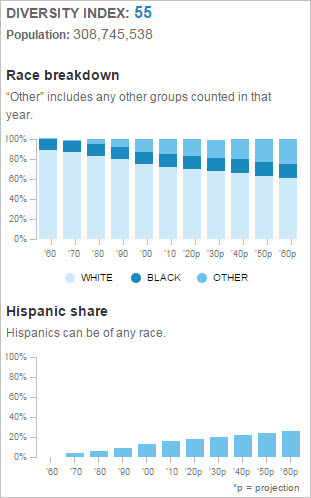 Population race/ethnic diversity varies widely by neighborhood in the United States. This section reviews use of tools that you can use to examine patterns of neighborhood race/ethnic diversity for anywhere in the United States. There are many types of neighborhood diversity (economic, age, etc. ); we examine just one here — diversity based on race/ethnicity. Using the tools and resources described in this section, you can also examine many other types of neighborhood diversity, or simply sub-county demographic-economic characteristics. The graphic below shows diversity patterns by census tract in the Alexandria, VA area. 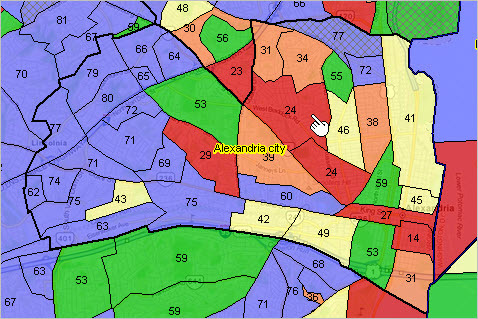 The view of Alexandria shows census tracts with black boundary and labeled with the diversity index. See more about analyzing neighborhood diversity patterns in this related Web section.